Most of the time, we would think that greeting cards are pretty much outdated in this day and age, thanks to a slew of e-greeting card sites that mushroomed a fair number of years ago, not to mention the fact that well wishes seem to be sent via social media and instant messaging these days. Having said that, how about going old school with the $7.99 DIY Wooden Greeting Cards? As the name suggests, these are cards that will feature die-cut parts out of wood, and is meant to be put together, where you can choose from either a Thank You Card or a Congratulations Card. 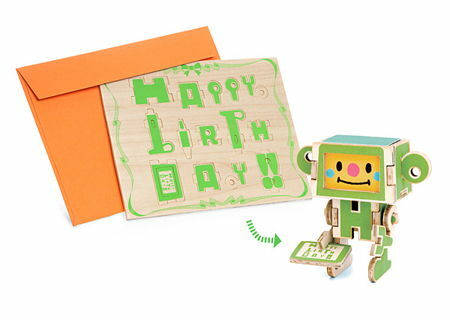 Not only that, the cute little robot is definitely endearing to anyone, and as you mail your recipient an envelope, you will be able to write your note on a piece of paper that slides into the assembled bot’s head.